This is an easy classic salad. I usually make it as a side dish for a special dinner, but it was lunchtime, and I wanted something light but extra tasty. 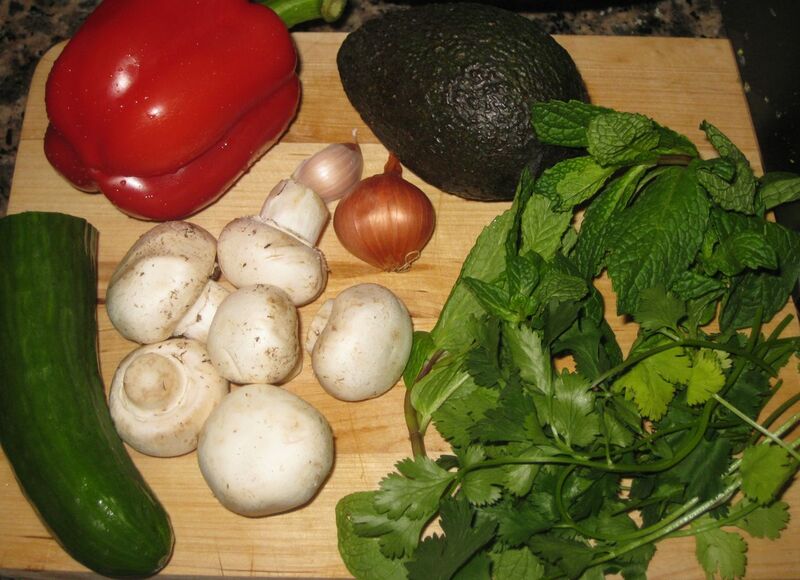 Simple ingredients, ready to be transformed. 1 hearts of romaine, chopped. 1/2 apple, quartered, cored, and chopped. 1 1/2 T blue cheese, crumbled. I was feeding two of us, so I gathered doubled the ingredients above. I like this salad lightly dressed, so I didn’t bother making two batches of dressing — one jar worked perfectly for two salads. I mixed up the vinaigrette first, so the flavors would meld, and then I chopped my salad ingredients. 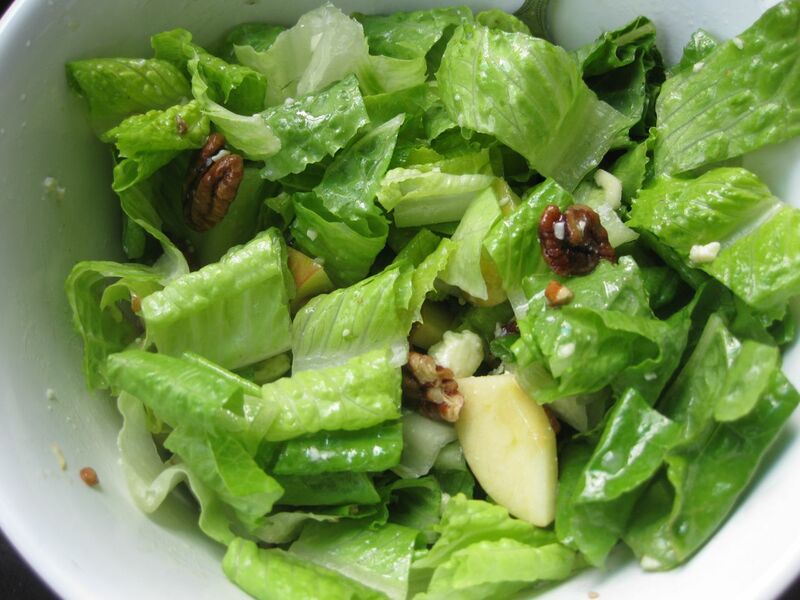 First, I built a crispy bed of romaine, and sprinkled the nuts and cheese over the top. I put crumbled blue cheese into the salad as well as in the vinaigrette because I love the creaminess it adds to the dressing, but I don’t want to sacrifice the tasty clumps that you get when you put it directly into the salad. It’s a win-win to have it both places. Then I chopped the scallions and the apple and added them to the salad. I drizzled the vinaigrette, tossed, and enjoyed. Luscious. Delicious. Ready to be devoured. I always love this salad. Sometimes I use pear instead of apple. Sometimes I use arugula. Sometimes I go for the mixed greens. Regardless, the crunchy nuts and the clean fruit work perfectly with the creamy, tangy blue cheese. 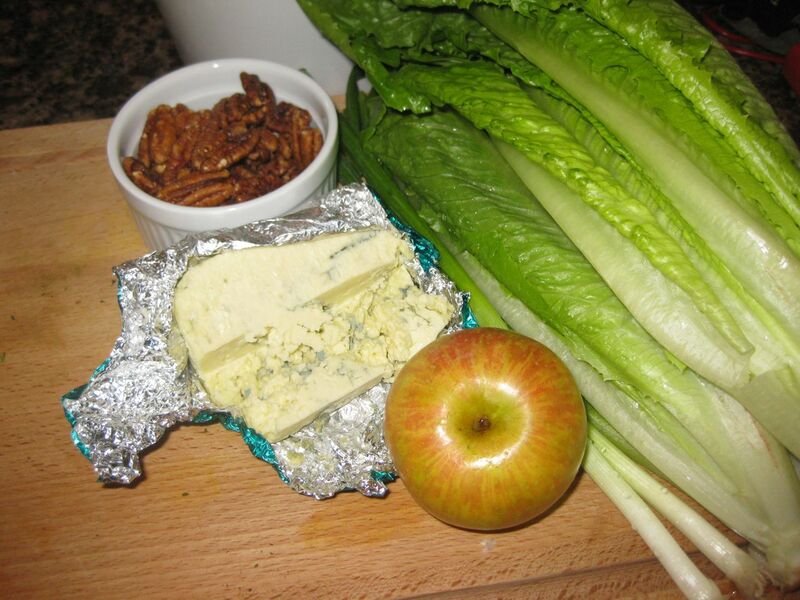 I really enjoyed the super crunch of this one, with the crispy apple and the fresh romaine. I tossed the scallions in on a whim, and decided they were irrelevant. They didn’t detract or add, they were just there. I probably won’t bother with them next time, but if you really love a little extra onion crunch, go for it. The apple needs to be packed in the jar with the dressing so that it doesn’t brown. 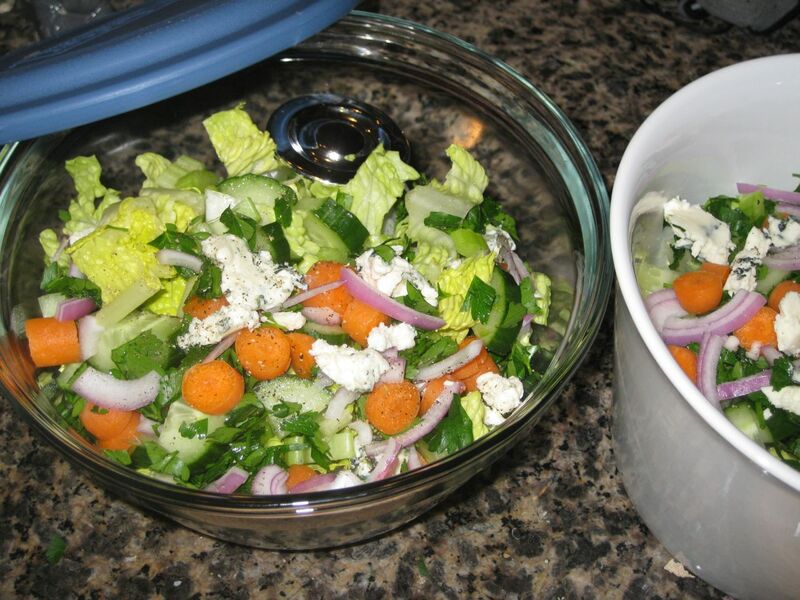 Keep the rest of the salad ingredients in a large glass or stainless steel container, and combine the dressing with the salad when you’re ready to fork toss and eat. I was making curried chicken with potatoes and basmati rice for dinner, and I decided to get creative. I knew I wanted a salad with a creamy dressing to help me tolerate the heat of the spicy curry. Riffing on the idea of raita, I wanted a yogurt salad dressing with lots of cucumber and mint. My plan was to turn that into a flavor base for a rich veggie salad. I pulled out all the vegetables that seemed like they might work, and I tossed in an avocado. I grabbed the cilantro on a whim, and then turned to the spice cupboard. I wanted something to round it out, and to capture a little of the delicious complexity of actual Indian food. I sniffed every jar we had of powdered yumminess from Vik’s Chaat Corner, and finally found what I needed. Fennel powder. My secret ingredient. 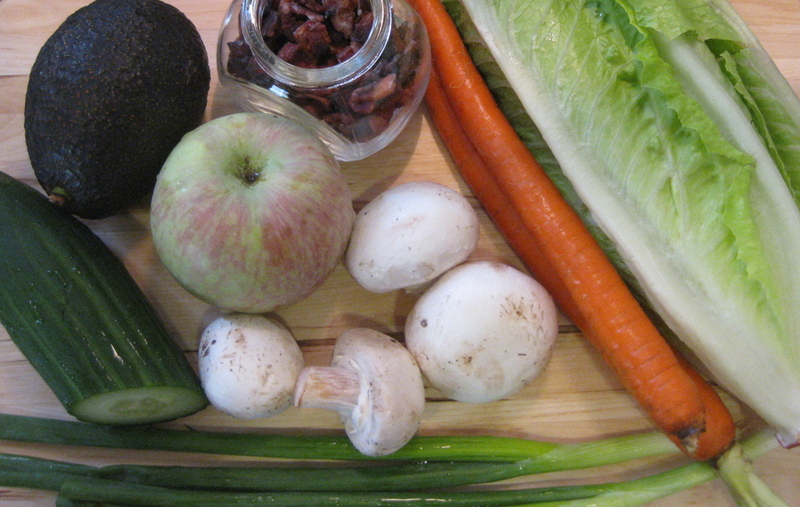 Simple veggie ingredients, ready for chopping. A gorgeous green bed of romaine and arugula. 1/3 of an english cucumber, quartered and sliced. 1 large fistful of mint, chopped. I mixed up the dressing first, playing with it and testing it as I worked by dipping leaves into the jar and tasting. 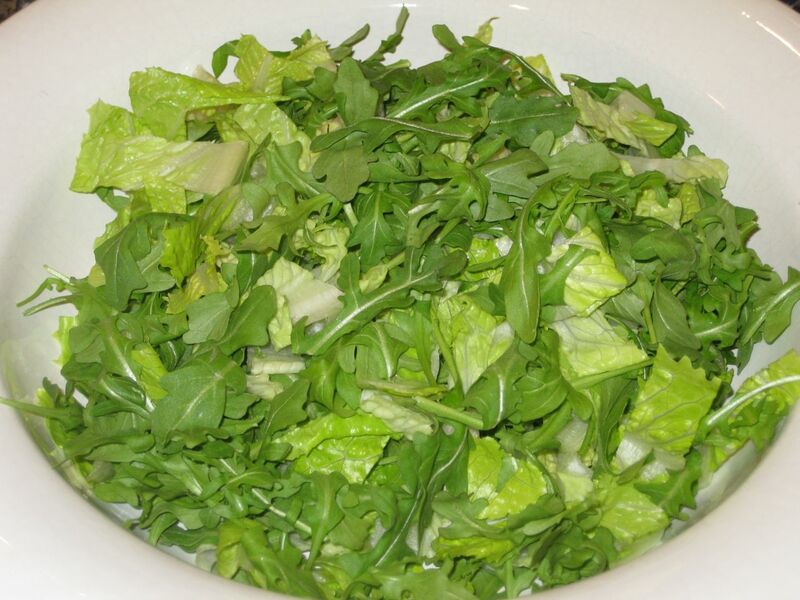 I chopped my romaine and made my bed of greens, gently finger tossing the arugula with the romaine. I sliced, quartered, and chopped all of the vegetables and herbs, adding them while monitoring the curry and listening for the rice timer. This salad was amazing. It worked perfectly with the curry. It’s obviously not even remotely authentic Indian cuisine, but it was seriously delicious. My husband was really impressed by the unusual flavors. The creamy dressing clung to the greens, and the variety of fresh vegetables was refreshing and fun alongside the simple, hearty curry. The kids all enjoyed it as well — I thought it would be too weird for them, so we barely had enough to share. 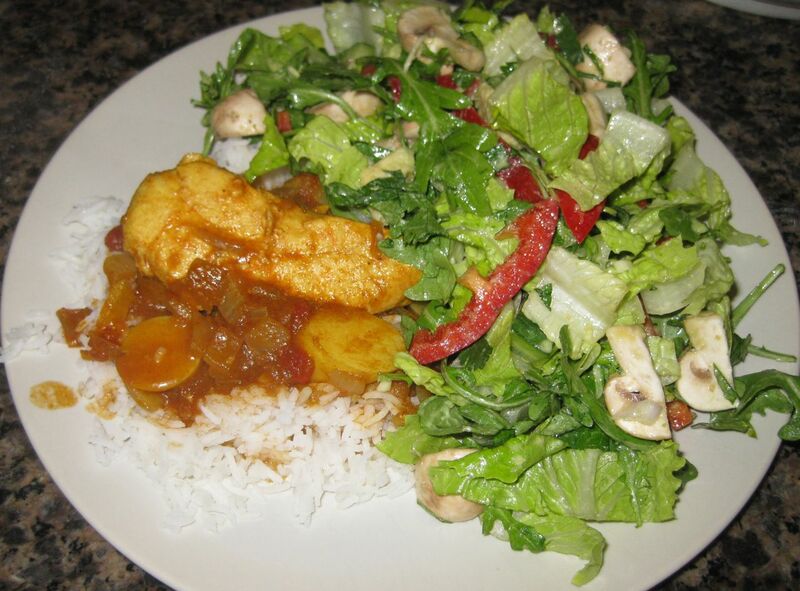 Isn't it lovely on the plate with the curried chicken and potatoes? I think it could work as a meal as it is, but if you need more protein, I recommend adding simple chicken or garbanzo beans. .As always, but the avocado in with the dressing and give it a gentle shake to coat it with the acidic vinaigrette to prevent browning. 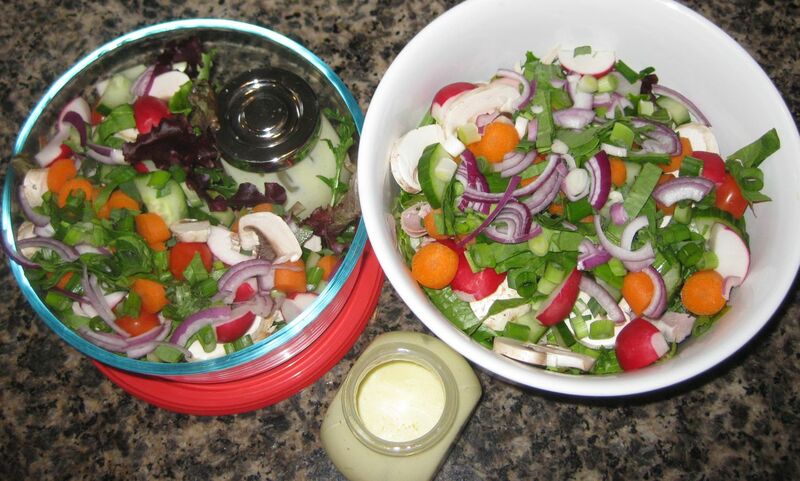 Keep the dressing in a small jar, and all the rest of the salad ingredients in a large container (I recommend glass or stainless steel with a tupperware style lid). When you’re ready to eat, shake up the jar of dressing and drizzle it over the salad. Use only what you need. Fork toss, or put the lid back on the large container and give it a few good shakes to combine. Enjoy. Going for a quick run this morning left me no time for salad prep before my husband left for work. He wasn’t fazed — he fends for himself with ease. But not doing the prep for him meant I didn’t do it at all until it was lunchtime. Luckily, I had my mother-in-law over in the morning to work with my kids, so I wound up with more time to play in the kitchen while also being a lot more awake — I was making salad at 11:30 AM instead of before 8:00 AM. Inspired by a small jar of homemade bacon bits (leftover from the kids Carbonara lunch yesterday) I decided to try my hand, once again, at making a ranch dressing that I actually like. 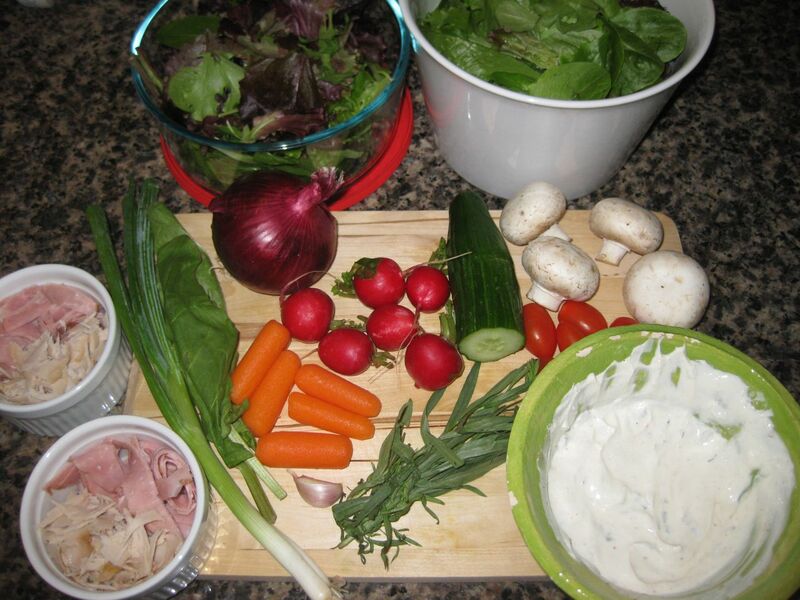 Salad ingredients, gathered together and ready to prep. 1/2 heart of romaine, chopped. 1/2 apple, quartered and sliced widthwise. 1/2 avocado, quartered and sliced. 1/8 cup of crispy bacon, crumbled. 1 generous pinch of salt, to taste. I doubled the salad ingredients listed above and assembled them in two separate bowls, one for my mother-in-law, and one for me. 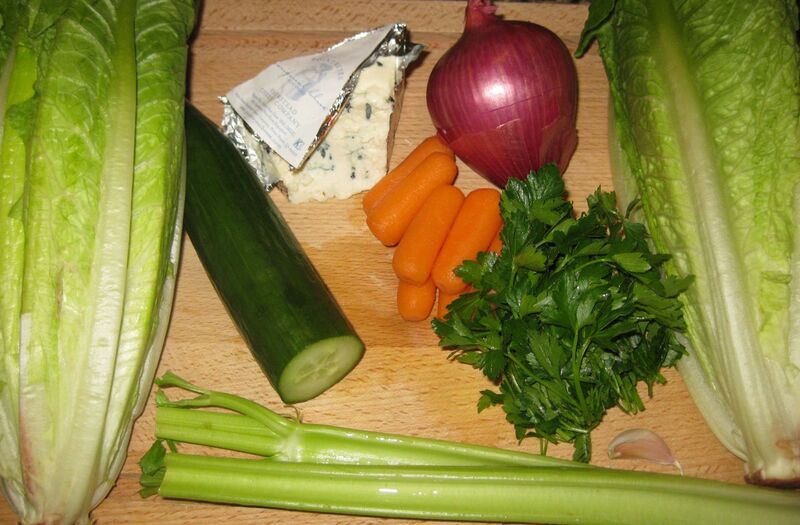 I mixed up one batch of the dressing, since I like to go light with creamy dressings, and then I started chopping. It took a while, since I also had french toast and grilled cheese on the stove for the kids, but eventually both bowls were full of salad. I made sure to cut the avocado right before serving, so it would be lovely and green when we ate it. Here is one of the finished salads, in a kidmade ceramic bowl. Not exactly ranch dressing, but damn tasty. It’s hard to go wrong with bacon and avocado. I wanted to mix arugula in as well, since I tend to like salads with a little more green in them and I only had one lonely heart of romaine left, but my arugula had gone slimy. Trader Joe’s is great for candied walnuts. Not so good for fresh produce. I think that was actually for the best though, since the romaine worked really well with the creamy dressing. Arugula would’ve been a bit too peppery and strong, I think. 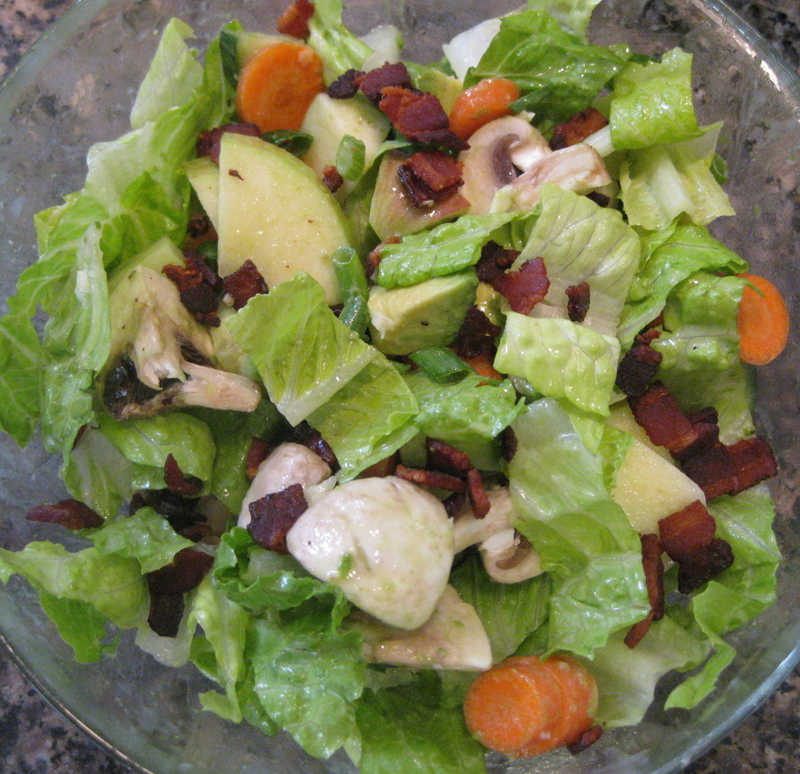 I loved the apple, bacon, avocado, carrots, mushrooms… Okay, I really liked everything about this salad. Strong flavors. Salty and sweet. Excellent crunch, with lush nibbles of avocado and that creamy dressing to smooth it out. Each bite was unique. Very fun, colorful, and delicious. My mother-in-law was appreciative, and I think she really adored the little crunchy bacon bits. 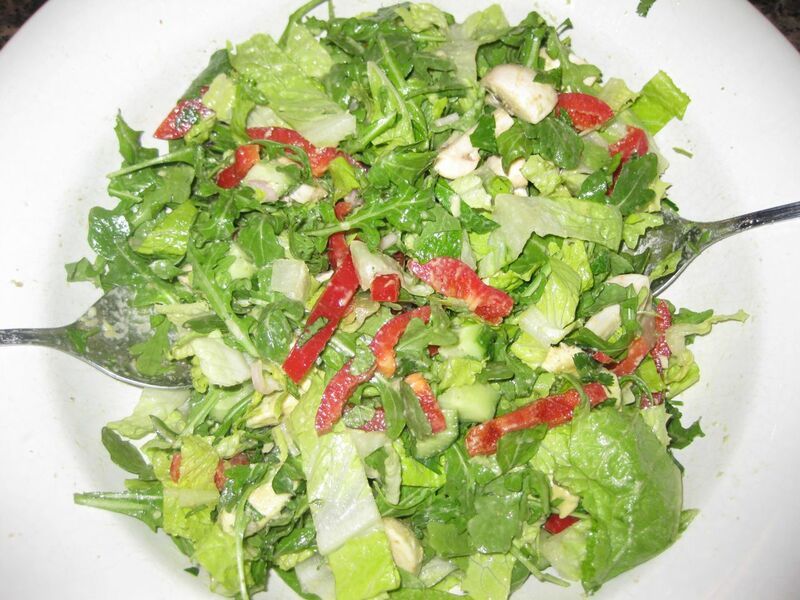 Here is the other salad, beautifully colorful in a simple glass bowl. Done. I would’ve happily tossed some chicken breast in if I’d had any on hand, but it was fine on it’s own. This one would work really well packed to go — just make sure you’ve got a jar large enough to hold the apple and the avocado in with the dressing. 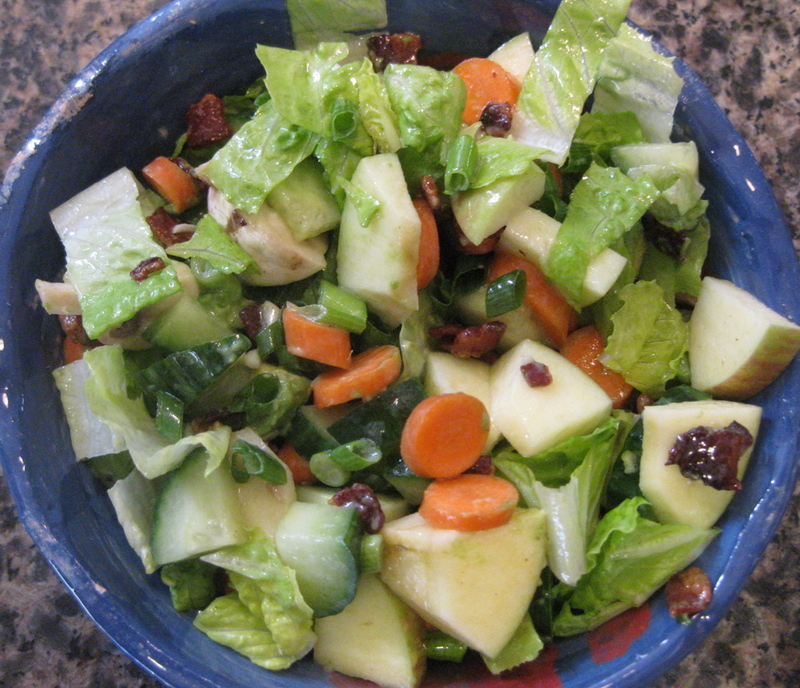 Brown apples and avocados are no good, and both will stay fresh in the acidic dressing. The avocado will create more thickness in the dressing, and you’ll have less chunks on the fork, but it will still taste delicious. If you really want the avocado chunky, half an avocado, still in the skin, travels relatively well. You’ll have the one brown side, which you can trim off or ignore, but the rest of it will be perfect. Of course, if you’re packing salads for two people who will be eating at the same time and place, you can leave the avocado untouched until you’re ready to eat, and cut it into the salad at that point. And if you’re a real avocado freak (yes, like me) you can just give yourself extra avocado. This salad has enough crunch to handle all that creaminess. Your skin and brain won’t mind the extra healthy fats, either.